Rich Rodriguez, head coach at the University of Michigan recently said: “There’s so many variations of the spread that’s different" - so when the Chairman of The Board speaks, I decided to dig a little deeper. 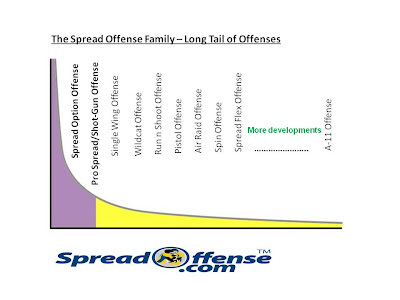 In an effort to make the piece more interesting in regards to the many pieces of the spread offense in football, I decided to use 'The Long Tail' model to explain the spread offense 'family'. For those of you not familiar with 'The Long Tail' - it is a model used in business and certain industries to show how front heavy, high frequency occurrences (usually the most popular occurrences) are followed by the events at the far end of the tail, which have very low probabilities of occurrences. The author, Chris Anderson argues that though the long tail end of the model is the less popular 'occurrence', they can collectively make up a market share that rivals or exceeds the relatively few popular occurrences, if the distribution channel is large enough and efficient enough to get the message and instruction out. Has the Internet and speed of communication over the last 10 years accelerated the branches of the spread offense in the long tail? The spread option offense is a variant of the more generic “spread offense.” It has found unprecedented success and widespread employment in college and high school football. Essentially a hybrid of the traditionally pass-oriented spread offense, the spread option is based on the concept of defensive isolation. The offense "spreads" the defense by aligning in three-to-five receiver sets, using two or fewer running backs in the backfield and often setting the quarterback in shotgun. This “spread” forces the defense to defend more of the field and isolates its players in “space”. To exploit this, the offense employs double or triple option plays which further mitigates the athleticism of the defense and forces it to play their assignments. When used in combination with a consistent passing game, the spread option offense can yield strong results. The means by which option plays are run from the spread option offense vary greatly. The most popular running play employed in the spread is the read option. This play is also known as the zone-read, QB Choice, or QB Wrap. A type of double option, the read option is relatively simple play during which the quarterback makes a single read (usually of the backside defensive end or linebacker) and decides whether or not to hand the ball to a running back on a dive or slant track. Others have found even more innovative ways to run the option from spread formations. The "Spread Offense" is a generic term used to describe an offense that operates out of a formation with multiple wide receivers, usually out of the Shotgun, and can be run or pass oriented. One of the goals of the spread offense is to stretch the field both horizontally and vertically, and to take what is normally most teams best defenders (linebackers) out of the game or out of the box (TE to TE at the Line of Scrimmage) by utilizing three or more receivers. As a result of the Pro Spread influence, the New England Patriots (for example) will frequently run their offense with five potential receivers and an empty backfield should a favorable matchup present itself. With Randy Moss and Wes Welker in the Patriots offense, the Patriots have placed an emphasis on a wide open passing attack. Although the Single-wing has lost much of its popularity since World War II, its characteristic features are still prevalent in all levels of modern football. They include pulling guards, double teams, play action passes, laterals, wedge blocking, trap blocking, the sweep, the reverse and the quick kick. Many current offenses, such as that of the Florida Gators coach Urban Meyer, use Single-wing tendencies for running plays, while using wide receivers instead of wingbacks. Once a strong running formation, the single wing has been replaced by formations that facilitate passing, while minimizing the running aspect of the game. Today the single-wing has evolved in what coaches call the spread offense or shotgun, with the emphasis on passing. The most noticeable feature that remains of the powerful Carlisle formation is the long toss from center to the main ball-handler. The main talent and field general has become the quarterback instead of the tailback. The other single-wing backs have moved close to the line of scrimmage and are split farther from the main line. Wide receivers are called split-ends, flex ends, slots, and flankers. Also, linemen spacing has increased in distance. Moving offensive players farther apart serves the purpose of also spreading the defense. The goal is to make defenses cover the whole field on every play. The wildcat formation, (or wildcat offense) a variation on the single-wing formation, is an offensive football scheme that has been used at every level of the game. The general scheme can be instituted into many different offensive systems, but the distinguishing factor is a direct snap to the running back and an unbalanced offensive line. The wildcat is an offensive package rather than an offense, in that it uses the same pre-snap motion coming across the formation on every play in the package and every play initially looks like a sweep behind zone blocking. However, after the snap several things may happen once the motion man crosses the player receiving the snap. The Wildcat was popularized on the college level by current Auburn offensive coordinator Gus Malzahn, and current Miami Dolphins quarterback coach David Lee in their former jobs as offensive coordinator with the Arkansas Razorbacks. In 2006, Malzahn, and in 2007 Lee, was the offensive coordinator for the Arkansas Razorbacks. Relying on the experience of quarterbacks coach David Lee who had run the scheme at Arkansas, the 2008 Miami Dolphins implemented the Wildcat offense beginning in the third game of the 2008 season with great success, instigating a wider trend throughout the NFL. The Dolphins started the Wildcat trend in the NFL lining up either running back Ronnie Brown (in most cases) or Ricky Williams in the shotgun formation with the option of handing off, running, or throwing. Through eleven games, the Wildcat averaged over seven yards per play for the Dolphins. "It could be the single wing, it could be the Delaware split buck business that they used to do," Dolphins offensive coordinator Dan Henning said. "It comes from all of that." On September 21, 2008, the Miami Dolphins used the Wildcat offense against the New England Patriots on six plays, which produced five touchdowns (four rushing and one passing) in a 38-13 upset victory. Some reading this may say... "The Run and Shoot Offense is one of the foundations of the spread offense, how can you have it so low on the tail?" Well, I'd have to say that the popularity of the run and shoot has diminished significantly, sort of like the Sony Walkman to the Apple iPod. That doesn't mean they're not important parts of the family, they just lost their popularity due to either advancements in innovation or technology. You'll notice in between the Spin Offense and the A-11 Offense I placed the wording 'More Developments'. I truly feel the long tail of the spread offense will develop and evolve more variations, and those new variations will hit the information super highway, landing into coaches laps. So I guess Coach Rod was right.... the spread offense has so many variations, and expect more to continue to develop.